Gary Stanley Becker (December 2, 1930 – May 3, 2014) was an American economist. He was a professor of economics and sociology at the University of Chicago and a professor at the Booth School of Business. He was awarded the Nobel Prize in Economics in 1992 and received the United States Presidential Medal of Freedom in 2007. He was born in Pottsville, Pennsylvania. 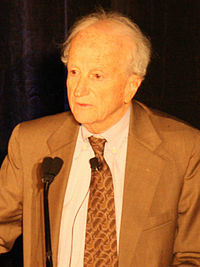 Gary Becker died in Chicago, Illinois from complications of surgery, aged 83. ↑ Harms, William (May 4, 2014). "Gary S. Becker, Nobel-winning scholar of economics and sociology, 1930–2014". Retrieved May 4, 2014. ↑ Mankiw, N. Gregory (May 4, 2014). "Very Sad News". Retrieved May 4, 2014. This page was last changed on 18 November 2018, at 09:46.